Detection and correction. Because there are many different things you can do to winterize a house, it’s important to accurately diagnose major comfort and energy problems first. Our experts use an infrared camera (shown above) to reveal air leaks and missing insulation. Dr. Energy Saver suggests that upgrading attic insulation be a top winterization priority. The energy improvement specialists at Dr. Energy Saver can inspect your home and provide you with an estimate that includes the most important improvements that will make the biggest difference in comfort and energy savings. 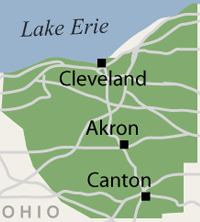 We work in Cleveland, Akron, Canton and nearby areas throughout Ohio. Dr. Energy Saver's free insulation inspection will reveal where insulation upgrades can have the biggest impact on comfort and energy efficiency. We can even use special infrared cameras to show you where air leaks and missing insulation are creating cold spots in your house. What energy-saving improvements are right for your house? For an expert assessment of your home’s energy profile, contact Dr. Energy Saver to schedule a free inspection and insulation estimate in Akron, Cleveland, Canton and throughout the Greater Cleveland area of Ohio..